Situated along the Lake Michigan shoreline, Muskegon is graced with miles of accessible, pristine beaches and northern woodlands. This diverse community offers a unique and affordable laid-back lifestyle rich in cultural and arts opportunities. Muskegon’s interesting history as a successful lumber town lead to a lasting philanthropic legacy evident in its historic downtown. Residents enjoy friendly neighborhoods and endless recreational opportunities unique to its beautiful lakeshore. Muskegon is a hotspot for the entrepreneurs-driven, knowledge-based economy where advanced manufacturing thrives alongside historic leaders in metal, plastics and agricultural products. The community’s focus on education, medical care, and sustainability lead to Forbes naming it as the highest-ranking city in Michigan for job growth. Muskegon offers a wealth of living options, ranging from beach side cottages to rural communities. The historic downtown area offers condos, apartments and townhouse options, and is surrounded by vibrant neighborhoods. 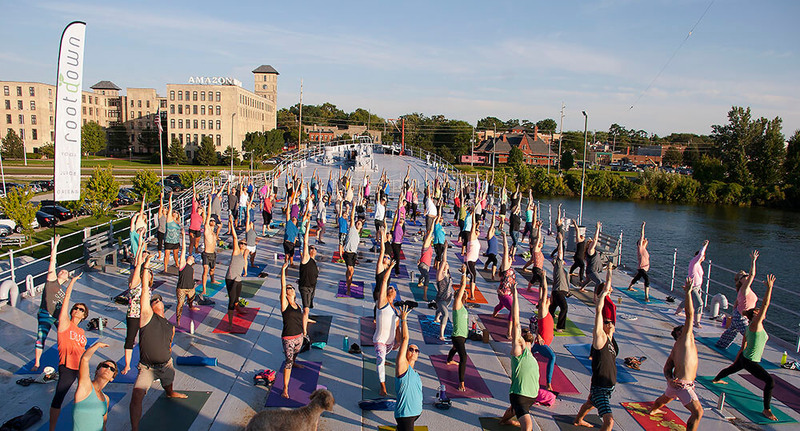 Muskegon’s surrounding communities offer a variety of living styles to suit the tastes of its diverse population. To learn about Muskegon’s suburbs, click on the following communities for more information. Nestled between Muskegon and Kent counties, Casanovia is situated at the top of a hill overlooking West Michigan’s beautiful orchard country. Residents of Casanovia typically attend Grand Rapids Public Schools. Located halfway between Muskegon and Grand Haven, Fruitport is an area rich in agriculture. Pomona Park provides easy access to the eastern tip of Spring Lake. One of the two towns on the eastern point of White Lake (Whitehall being the other), Montague offers a downtown shopping district, several parks, and extensive bike trails. 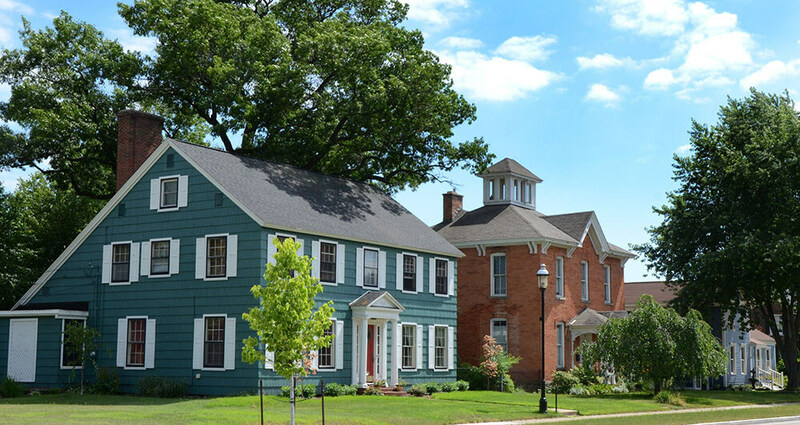 Located south of the city of Muskegon, and only four miles from the shores of Lake Michigan, Muskegon Heights offers a diverse setting for a growing family. Almost an island, North Muskegon sits on a narrow penninsula between Muskegon Lake and the smaller Bear Lake. The town has its own school district. On the south side of Mona Lake, with 6 miles of Lake Michigan shoreline, Norton Shores is a mix of rural and suburban. The nearby PJ Hoffmaster State Park offers a spectacular setting for outdoor enthusiasts. A rural community, Ravenna is a thirty minute drive from Muskegon. The township has its own school district and the village has two parks. A blend of residential and commercial, Roosevelt Park offers nine parks within its city limits, each one as unique as the neighborhood in which it’s located. As the other town on the eastern tip of White Lake (Montague being its norther counterpart), Whitehall offers a historic main street and easy access to Lake Michigan and White Lake for water enthusiasts. The Muskegon County Museum of African American Historyprovides local historical African American legacy information that will instill pride and motivation for young African Americans. Nature’s amenities are a draw for recreation-seekers, many of whom choose Muskegon for its 26 miles of Lake Michigan waterfront, 400 miles of rivers, more than 11,000 acres of inland lakes for boating, swimming, fishing or just relaxing as well as Muskegon’s award-winning beaches. A favorite port of call, miles and miles of trails and unspoiled coastline, rivers for rafting and fishing, and one of three luge runs in the U.S. make Muskegon a year-round recreation destination. Great Lakes Marina resides on breathtaking Lake Muskegon, which is 50 feet deep, 8 miles long and 2 miles wide, and connects with Lake Michigan allowing full access to the water and everything it has to offer. The main attractions of PJ Hoffmaster State Park are the Dune Climb Stairway leading to the top of a high sand dune where an observation deck offers a panoramic view of the dunes and Lake Michigan, the Gillette Visitor Center, three miles of sandy beaches, and 10 miles of hiking trails. 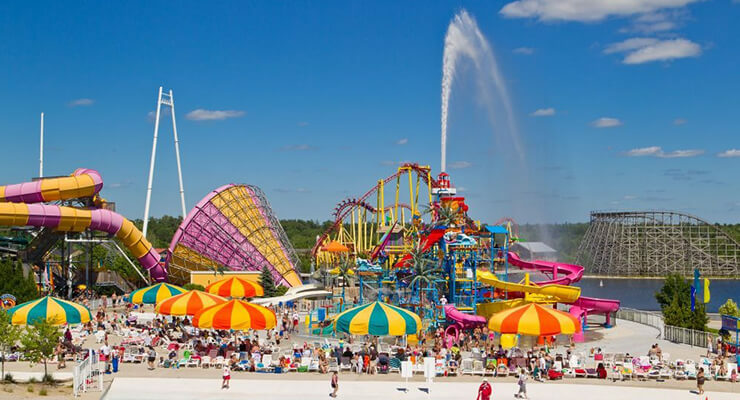 Michigan’s Adventure is a theme and water park featuring seven roller coasters. Gillette Nature Center promotes and sponsors interpretive activities and educational opportunities for the Muskegon and Ottawa county community surrounding the Gillette Visitor Center at P.J. Hoffmaster State Park. The Muskegon County Convention and Visitors Bureau offers a complete list of beaches and parks in the area. Muskegon Bike Time is a free, three-day motorcycle event. The Muskegon Lumberjacks are proud members of the United States Hockey League, the nation’s only Tier I junior hockey league and the leading producer of NCAA players and National Hockey League draft picks in the United States. The Muskegon Risers are a member of The Premier League of America (PLA) and participate in both outdoor and indoor soccer seasons. The West Michigan Ironmen Michigan’s only professional indoor football team and are currently playing the Champion Indoor Football League (CIF). The West Michigan Lake Hawks are a professional basketball team playing in the American Basketball League (ABA). Their home games are played at a few different Muskegon Area High Schools and their season runs October through March. Muskegon State Park offers more than two miles of shoreline on Lake Michigan and over one mile on Muskegon Lake, along with camping and hiking. The Muskegon Winter Sports Complex offers a luge run, ice skating, skiing, and more. Muskegon offers public, private and charter options for K-12 education. Muskegon County is now offering the Promise scholarship, for resident Muskegon Area high school graduates with a 3.5 grade point average or higher. To be eligible, the Promise Scholars must have graduated from a high school within the Muskegon Area Intermediate School District and the scholarship will be accepted at either Muskegon Community College or Baker College of Muskegon. Click here for more information. Muskegon Public Schools is dedicated to providing and promoting comprehensive educational, social, and cultural opportunities that will enable a diverse citizenry of all ages, interests, and abilities to lead productive, enriched lives. Known for their academic and co-curricular programs, the Fruitport district is located in Muskegon and Ottawa counties. They provide an environment that celebrates individuality, promotes problem solving through critical thinking and encourages students to fulfill their potential. Holton School District is situated in Muskegon County, in western Michigan. The District includes the Village of Holton, and all, or parts of, the Townships of Holton, Cedar Creek, and Blue Lake. Grades Pre K-12 are housed in three buildings and serve the District’s approximately 1000 students. Mona Shores Public Schools is recognized throughout the area as one of the finest K-12 school districts in West Michigan. Montague Area Public Schools serves children from the City of Montague, Rothbury Village, Montague Township, White River Township and part of Grant, Otto, and Claybanks Townships—an area of more than 120 square miles. The size of the district allows teachers to know students well and personalize their instruction. Our primary mission is to provide leadership and services that enhance the delivery of instruction for the 12 constituent school districts and assisting other public and parochial schools. Because families who live in Muskegon Heights stay for generations, students go to the same schools that their parents and grandparents attended. Students can’t get lost in the crowd because parents and teachers know each other and stay in touch. Helping students learn is everyone’s responsibility. The community of Oakridge Public Schools exists to prepare every student, within a safe and healthy environment, with a globally competitive education focused on college preparation, workplace success, and lifelong learning. Orchard View Schools believes in servicing the family as a whole. We provide an environment that promotes problem solving, critical thinking, and encouragement for all to reach their full potential. Ravenna is a progressive community that values young people. The entire community strives to meet the educational, social and emotional needs of its students. There are many examples of the community’s dedication to this task. In 2008 the district passed a $14.8 million dollar bond initiative. An organization that lacks direction or a specific vision can not move forward. What we do best at Reeths-Puffer is teaching and learning. We strive to be the best at what we do and a strategic plan is critical to that success. Students, staff and parents of Whitehall District Schools are part of a community that takes pride in a quality educational system committed to the expectation that all students can and will learn. Educational programs are available for learners of all ages, child through adult. Two elementary schools, one middle school, one high school, and a community education program provide opportunities for all residents. Since 1980, CCS families in the greater Lakeshore area have chosen to be part of an educational community that understands the advantages of the local homes, local churches, and a family-friendly local school constructing a framework for life upon the same firm foundation. Catholic Schools in the Diocese of Grand Rapids are an alliance of 30 vibrant learning communities serving more than 6,600 elementary and high school students throughout West Michigan. Their 25 elementary and five high schools inspire young people to grow in faith and grace, achieve more in school and life, develop creativity and character, and feel welcomed and cherished for their unique gifts. They partner with parents to awaken the whole child to a world of light and life — that grows better and brighter when children reach their potential. Muskegon Catholic Schools educate each student in spirit, mind, and body by fostering personal excellence within the Catholic tradition. Western Michigan Christian High School’s mission is to educate with excellence, integrate faith with knowledge, equip students to work and serve Christ in their communities. It is a 4 year private Christian school accredited by the Michigan Association of Non-Public Schools. Annually, more than 90% of our seniors enroll in two- or four-year college programs after graduation. Timberland Charter Academy, home of the Timberwolves, is located 9 miles from Lake Michigan in Muskegon. We serve a diverse population of over 550 elementary and middle school students in our safe environment. Muskegon child care provider options are many and varied. There are child care providers that offer traditional preschool and kindergarten programs, full and half day child care in Muskegon MI, as well as before and after school care programs. Many Muskegon child care providers offer a specific type of learning approach or combination of learning approaches. For example, there are many child care providers that offer a “developmental approach”, an approach that is based on helping children thrive in learning and play. Other preschools and daycare providers of child care in Muskegon MI offer more formal approaches, including Montessori, Reggio Amelia. This website that makes it easy to find child care in Muskegon MI. You can simply enter your home or work address and find preschools and daycare centers that are within 5 miles, 10 miles or even 15 miles. Muskegon Nannies – Search by availability, experience, and nanny rates! For lists of Childcare facilities in the Muskegon area try these websites below. InfoMI provides a list of the diverse places of worship in Muskegon. Muskegon offers an array of healthcare options, ranging from large health systems to small hospitals and clinics that are sure to fit your needs. Mercy Health is a nationally recognized healthcare destination with an unrelenting commitment to innovation, quality, diversity, compassion and access for all. There are three hospital campuses: Hackley Campus & Mercy Campus, located in Muskegon County and the Lakeshore Campus, located in Oceana County. Spectrum Health Gerber Memorial Hospital mission is to provide quality health care to the community. Located in Freemont, northeast of Muskegon. HealthWest is a public provider of services for people with developmental disabilities and/or serious mental illness. Pine Rest provides the Muskegon community with quality mental health care, including therapy and psychiatric services for children, adolescents, adults, and families. 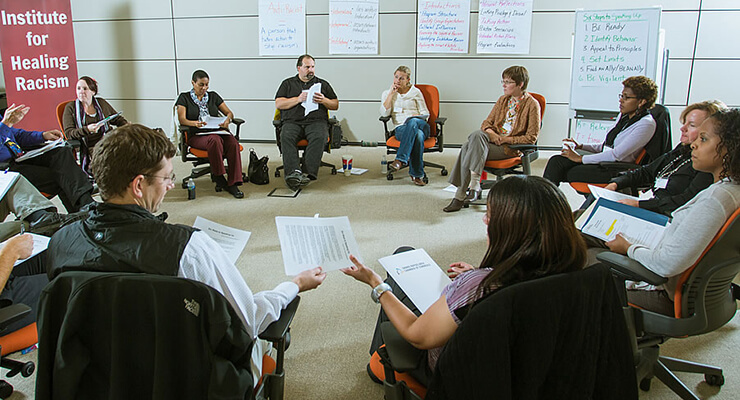 Mercy Health’s staff of state-licensed social workers, PhD psychologists, MA psychologists and counselors work with a psychiatrist to deliver a host of behavioral health services. Mercy Health Center for Children’s Health and Safety offers a variety of programs and services designed to help children of all ages maintain a healthy and safe lifestyle. The Cancer & Hematology Center of Muskegon is a large network of cancer centers built to deliver state-of-the-art cancer care throughout the region. The Mercy Health’s Johnson Family Cancer Center promotes recovery by providing a soothing environment for patients and their families. Patients have access to the latest technology and receive their chemotherapy and radiation in one convenient location. Mercy Health offers a complete range of services at the Dan & Mavis Thill Heart & Vascular Center and the Heart Center. These Centers provide open-heart surgery, cardiac surgery, vascular surgery as well as comprehensive wellness and rehabilitation for better health.